The day began just before 9 am as we greeted our paddlers at the private pool on the grounds. With a couple of inflatables Jeremy Riggs and I were ready to review all the finer points on downwind paddling, from safety to technique. Though the temperature on Maui is always mild, the heated pool was a treat as Jeremy demonstrated some of the more advanced downwind paddling techniques and footwork. Next the students would practiced the same in the pool. This was a great way to learn. After a couple of hours of instruction and reinforcing everyone’s technique and new skills, it was my turn to get their heart rate up and teach everyone the finer points on how to train for downwinders. 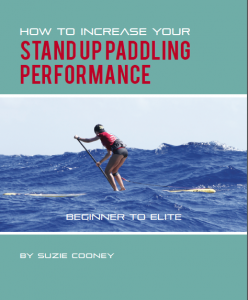 I gave a small lecture on cardio, mental strength, and the importance of a strong core, balance and reaction training; all related specially to downwind paddling. With a few pieces of training equipment, everyone had the chance to participate in all modalities mentioned above. We even had the chance to practice downwind paddling bracing, which is a key essential for success. Everyone was a good sport and supported each other, even when Rich ( from Australia ) displayed his “earthquake” moves on the BOSU while balancing on one knee. I was honest and noted this was for critical for hip strength and speed for driving the board through the water. His smile was bright while he shook and quivered. His assignment, to quiet the earthquake in one month and report back to the group with a video. An amazing and special organic lunch was prepared by the chef and staff onsite at Lumeria Maui. They have a restaurant called the Wooden Crate that is also open to the public. Our food came out beautifully prepared and consisted of fresh grains, greens and organic chicken and the most refreshing hibiscus tea. As we dined everyone shared their some of their previous downwind stories and adventures, but they were most excited for our big adventure, a full Maliko Run from Maliko Bay all the way to Kahului Harbor. This is roughly 10 miles of open ocean paddling. The forecast was predicted to be a windy run, but there were a few daunting rain squalls coming through. We were still on no matter what. We said our Mahalos to the gracious host Douglas Drummond, the General Manager of Lumeria Maui. One by one we walked down the boat ramp eager to go. The winds had dropped a bit which made for a very easy Maliko exit. Typically this first section out is was is most difficult. This time we were all actually able to stay pretty close all the way out. Rich was definitely into “churning the butter” as was Adrian. Shantelle paddled so hard out and fast we thought she may be racing up to Hana! We easily regrouped every couple of miles while Jeremy and I would coach and observe. With the lighter than expected trades, this meant extra paddling but also a good opportunity to learn to catch and read the smaller bumps. Everyone did very well and was evenly paced. It was so cool to see our students putting into practice what they learned. Jeremy and I were very watchful as safety was our number one item of the day. Congrats to those who joined us for our Maliko Downwind SUP Advanced Course and know you have new downwind paddling friends and coaches for life. You rock!